According to a representatives from Bell, all new iPhone upgrades will require a new monthly plan. If you are a Bell customer and you are looking to upgrade to the iPhone 6 or iPhone 6 Plus and you are on an old plan, the carrier will now force you to upgrade to one of the company’s newest plans which start at $80 per month. 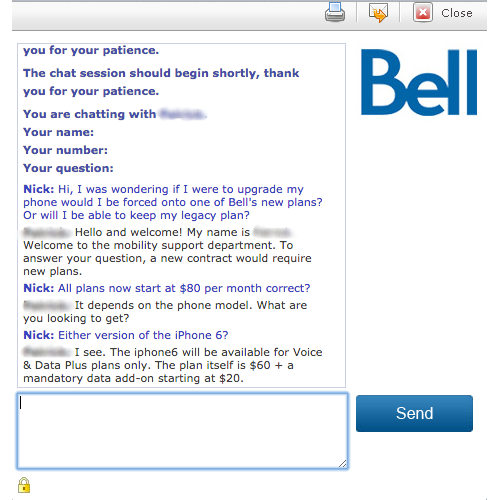 As you can see in the image above, a customer service agent at Bell said that any new iPhone upgrades (all upgrades require customers to sign a new contract) needs to be accompanied by a new plan from Bell. The main portion of the plan is $60 per month and all iPhones require an additional $20 per month data add-on. MobileSyrup has similarly confirmed that Bell will be forcing customers onto their new monthly plans. If you are an existing Telus customer, the company tells us that you may be able to keep your existing plan, however it depends on which legacy plan you have. The Telus representative tells us if you have been a long-time and loyal customer, the loyalty department should offer you something similar or better than your current plan. All new Telus customers looking to purchase the iPhone 6 or iPhone 6 Plus will be required to sign a two year contract with a minimum $70 per month plan. Back in August, Rogers confirmed that any new iPhone upgrades will require a minimum $80 per month plan. We have confirmed that Rogers will be forcing users to upgrade to new plans, unless your current plan is at least $80 per month. 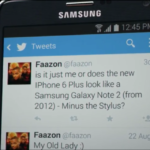 What are you expecting to pay for your monthly plan if you upgrade to the iPhone 6 next week? Let us know in the comments below.